This is Ace. Our newest addition to our family. My husband first saw him at a rescue group website. He was being passed up because he was deaf. This broke my husband's heart and adopted him. He called me and told me that he adopted him and I was thrilled. He is so handsome! This will be our 2nd deaf Aussie. Welcome home Ace. We love you! It is wonderful that you have adopted a special needs pup! I am sure you will be blessed with this addition to your family. Ace is sure handsome! 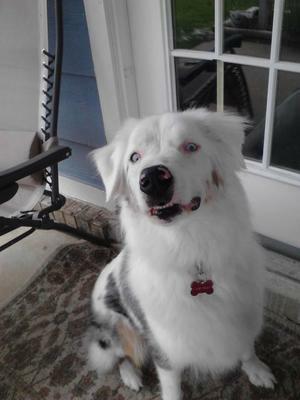 I have had my deaf Aussie since she was 5 months old. I teach her with sign. She can do everything. At age 11 she got her UKC Rally Novice title. In December she was diagnosed with a tumor on her lung. Had surgery and 6 months later is doing fine! She is my miracle dog! Ace sure is a handsome boy. And it so wonderful that you're giving him a loving home. Good for you to have adopted deaf Aussies. I also have a deaf girl, Marlee. She is deaf due to an infection and high fever. I found her at 5 months with a rescue group. She is now 11 years old. I taught her with sign and she can do everything. This past November she earned her UKC Rally Title. She also survived cancer surgery this past December. She is an awesome Aussie! Good for us! Ace is ever so sweet, you did the right thing by adopting him. We have two Aussies that we love, one 7yrs. & one 1.4yrs. I would never get any other breed. Enjoy him. You are soo special to do that! You will be blessed as much as Ace. Thank you so much for sharing this. I love aussies, have my second one now.